Playing my new Movie Quiz. It looks at a bunch of movies to see which ones have green ideas in them. 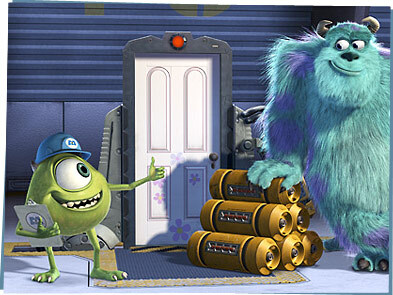 Like "Monsters, Inc."
The movie with the big fuzzy monster and his one-eyed friend? What's so green about that — besides the one-eyed monster? Hmm... he had a tough name. Ed Burtynsky! No, wait, that's not it. The Big Lebowski? It's Mike Wazowski! And it's in the quiz because the movie is really about their looking for renewable energy to power their city. And that's green! They capture screams to run the lights, but then discover that collecting laughter is more efficient. Remember? Take the Movie Quiz and see how well you do. They're all movies I think you'd know.